Having recently replaced my trusty Record Power DMS26 drill stand and mortise attachment with a floor standing WD16F pillar drill from Axminster I was keen to add a mortising facility, so I was pleased to find that Axminster made a mortising attachment that was compatible with my machine. The attachment will fit most pillar drills with a 55mm, 60mm or 65mm collar and will accept hollow mortise chisels with a 20mm shank - sold as 3/4in. Axminster recommend fitting the fence and hold down unit using an MDF mounting plate, but I wanted to improve on this to allow a greater range of adjustment to be carried out more easily. The circular work table on the WD16F has radial slots for mounting vices and attachments so the range of movement would be limited using the recommended attachment method. Also shown in this photo is a problem caused by a manufacturing error whereby the hole for the knob retaining the steel rod that supports the hold down had been drilled and tapped on the wrong side of the casting causing the knob to foul the hold down. I have made Axminster aware of this problem and they will be supplying an 8mm bolt to replace the knob with this batch of accessories until the manufacturing problem can be rectified. I decided to use T-track and T-bolts to attach the fence unit so the first step was to cut an 18mm MDF base to fit the work table, in this case 310 x 600mm fitted the depth of the table and allowed a decent width of table to support longer workpieces. 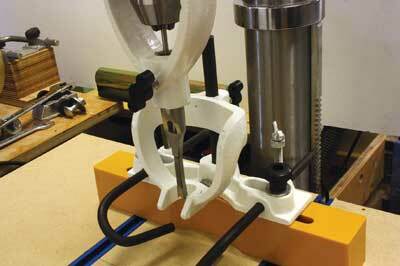 The exact size will depend upon the size and shape of the work table on your pillar drill. 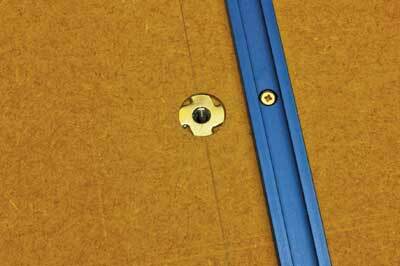 To this are attached two lengths of T-track spaced to match the mounting slots in the fence assembly. 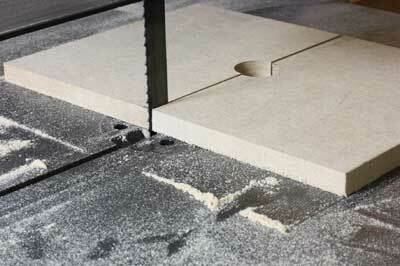 The table is then drilled and a recess cut in the surface with a Forstner bit to accept two threaded pronged tee nuts flush with the surface of the mounting board. 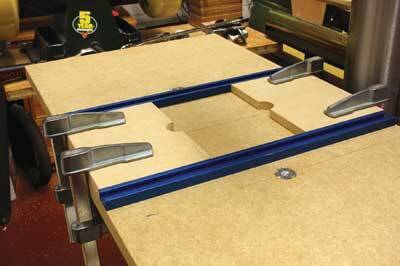 These will eventually be covered by a 10mm MDF surface board to bring the base level with the top of the T-track. 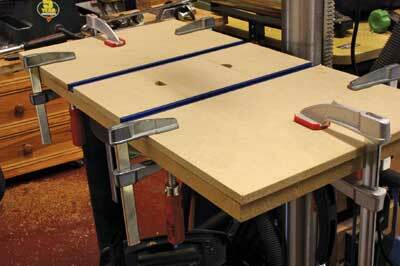 Again, the exact spacing will be determined by the location of the slots on your pillar drill's work table. Mark carefully from underneath the table, making sure the position does not coincide with the position of the T-track. 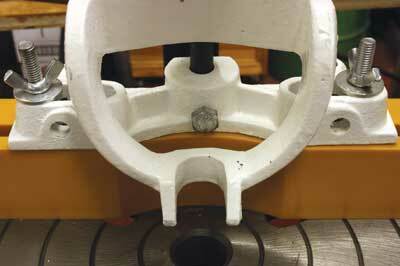 Once the pronged tee nuts are fitted the base unit can be fastened down to the work table using suitable star knobs. As the knobs are tightened they will pull the tee nuts tighter into the MDF, so there is no fear of them working loose in use as might be the case if threaded inserts were used instead. 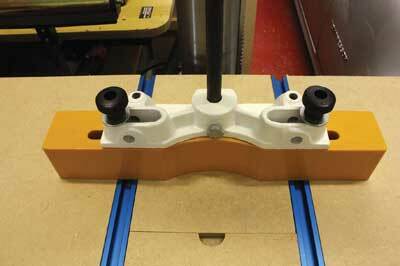 The pronged tee nuts must be fitted to the top surface of the MDF base. 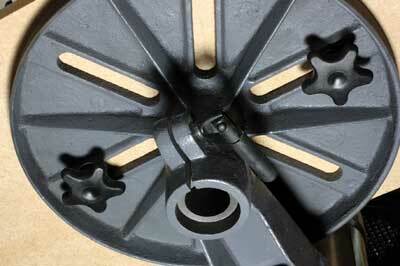 If fitted to the bottom face the action of tightening the star knobs will pull the tee nuts out of the MDF. 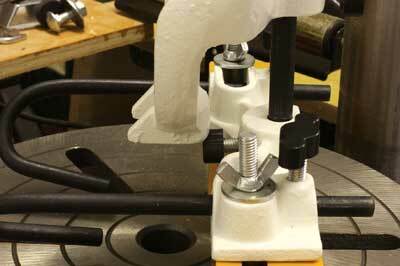 I have made this elementary mistake before when making jigs. I decided to fit a sacrificial insert so that if through mortises are cut, the mounting table will not be permanently damaged. 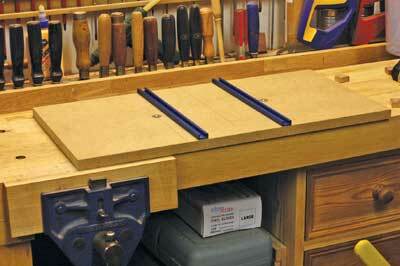 To facilitate easy removal of the insert, the surface of the table has finger holes cut into it. These are made by drilling through the centre of a piece of MDF that has been cut to match the distance between the T-tracks then cutting in half through the centre of the hole on the bandsaw. These are then glued and clamped in position whilst the larger surface plates at each end of the work table are measured and cut to size. 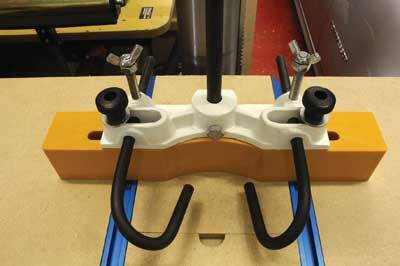 These too are glued and clamped in place, and when fully set the table is ready for the mounting of the fence unit. The 8mm x 110mm bolts and wing nuts supplied with the fence are replaced with 90mm tee bolts and knobs which hold the fence base and casting down to the table and allow fore and aft adjustment. As these would foul the original retaining knobs for the clamping rods, the retaining knobs are replaced with bolts made by cutting down the original 8mm x 110mm bolts and attaching the wing nuts to them using two 8mm nuts to lock them in place. The hold down can now be fitted to its rod, the chisel holder attached to the base of the quill, a hollow mortise chisel mounted in the holder and your pillar drill is ready for action as a mortiser. 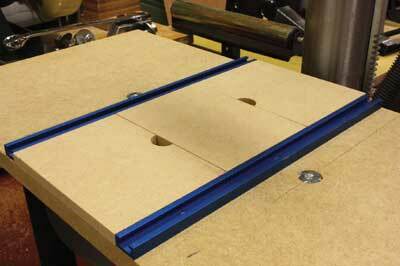 The table of course can also be used as an extension to the drill press table and additional accessories such as full length fences, hold downs and drill vice mounting plates could be added. I made this unit in a number of short sessions over a weekend including taking the photos, whilst doing other jobs in the garden and workshop. It could easily be made in a morning or less and makes a basic, sub £20 attachment into a much more useful and versatile addition to your pillar drill.